Take note, Microsoft fans: Gamescom 2013 will go down in the history books as the first time the Xbox One's UI has been demonstrated in detail to the public. The Verge reports that show-goers in Germany are getting an extended look at some of the Xbox One's core functions, including its game DVR capabilities, friends list, multiple account features, and newly revealed home theater controls. That's right! Thanks to its IR blaster, the Xbox One itself apparently serves as a remote control for your entire home theater experience, from your TV to your surround sound system. And it reportedly does it all with the new Kinect - you use an intuitive Logitech Harmony-like menu to point out your home theater accessories to the Xbox, and simple voice commands "Xbox, volume up" to make adjustments. A lot of what Microsoft's showing off this week has already been seen, but this seems to be the first time anyone outside the company is getting such a detailed look at the One's UI. Another new tidbit is that the Xbox One allows six users to be signed in simultaneously, according to Pocket-lint. Further, the new Xbox One Kinect can differentiate between these users by their voices; so when one player asks the console to display his or her friends list, the correct information appears. Those friends lists are actually more like Twitter followers, by the way, since Xbox One users can "follow" one another without necessarily having to reciprocate as in the previous friend request system. Though you can follow up to 1,000 users, your followers are not limited. And as was previously reported you can pin specific users to a favorites list for easy access. Also being shown off again this week is the Xbox One's game DVR functionality, which at the prompt of "Xbox, record that" captures the last 30 seconds of gameplay and uploads it to any number of services. However, that footage is still limited to 720p and 30 frames per second. 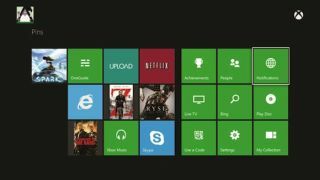 Don't be left in the dark - earlier this month Microsoft finally explained the Xbox One's sharing capabilities.